Bootie LA – America, F*ck Yeah! Los Angeles Bootie LA – America, F*ck Yeah! 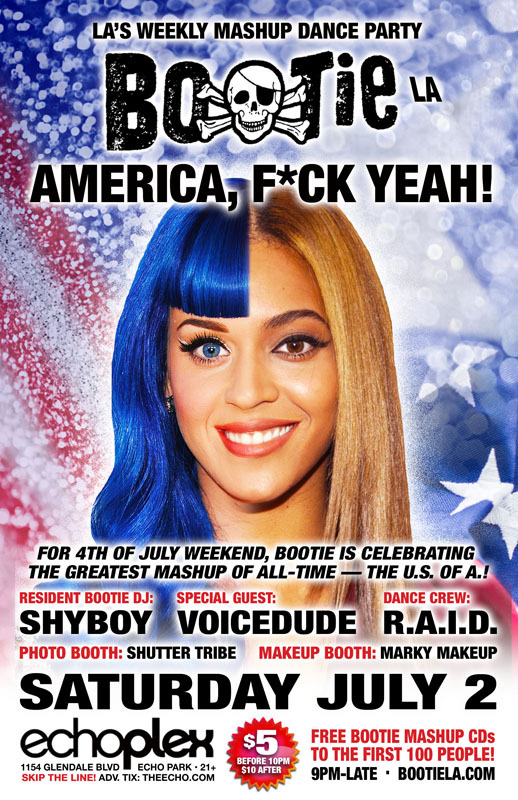 For the 4th of July weekend, Bootie celebrates the greatest mashup of all-time — the U.S. of A.! It’s AMERICA, F*CK YEAH! DJs ShyBoy and Voicedude spin all-American mashups! Only $5 before 10 PM! Wear red, white, & blue! Bootie celebrates 4th of July weekend with a special party — it’s America: F*ck Yeah! Resident DJ ShyBoy will be joined by special guest Voicedude, as they get the celebration going with some mashup fireworks, spinning freedom-flavored mashups to keep you dancing all night! Resident dance crew R.A.I.D. (Random Acts of Irreverent Dance) will perform an all-American Midnight Mashup Show, as well as their usual go-go antics, while Marky Makeup gives your bodies a patriotic makeover, and Shutter Tribe captures all the fun! All this, plus FREE Bootie mashup CDs for the first 100 people through the door! Wear red, white, and blue!